In Hiroshima, children as young as twelve had to help the war effort in munitions factories or by constructing firebreaks. Life was hard for the average Japanese, and many had started to question the official propaganda proclaiming how the Japanese were winning the war every day now. If we are winning, they asked, how come there is no food to come by, how come we live in absolute poverty? They now found themselves in the ruins of a city. One single bomb had decimated Hiroshima. There was no infrastructure left, no hospitals, no shelters. There was no food. Only the danger of radiation. 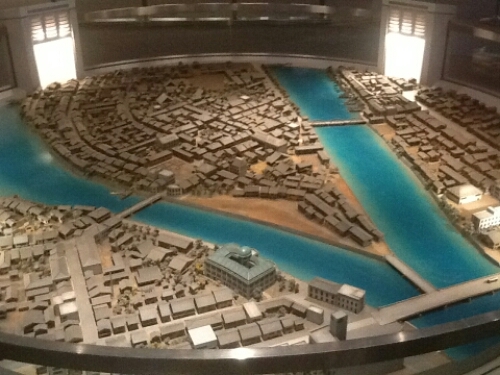 Model of the city just before the bombing. 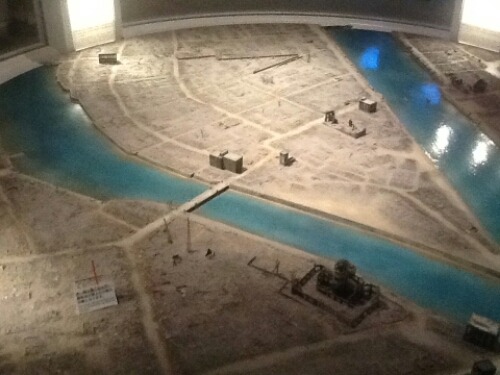 Model of the city just after bombing. Genbaku Dome in lower right corner. It is estimated that the atomic bomb killed 70.000 people instantly. In the months that followed, another 70.000 lost their lives. How many lives the atomic bomb ultimately took is almost impossible to say for sure. It is also estimated that between 2000 and 6500 children were orphaned due to the A-bomb. Many of them were left to themselves, living on the street, supporting themselves by whatever means possible. About 70% of the city’s buildings were destroyed, this included much needed hospitals. 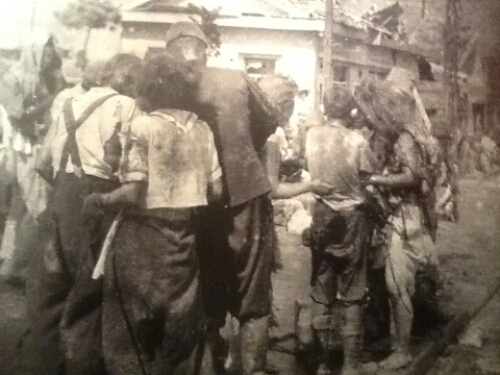 A large number of doctors and nurses were killed in the explosion, making the situation even worse for the survivors. At the Red Cross Hospital there was only one doctor on duty in the days following the bombing. Evacuation centres, makeshift hospitals and morgues were quickly established though, and it says something of Japanese organisational skills that only a handful of cholera cases were reported. In a ruined city, life slowly tried to return to normal. It did not take long before the citycars not destroyed were back in operation. The Hiroshima Peace Memorial Park. 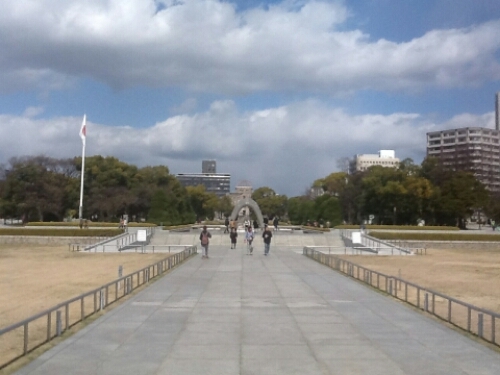 The Hiroshima Peace Memorial Park lies just south Of the Aioi bridge. It was opened in 1955, its design selected in 1949. The whole park is a memorial to the victims of the atomic explosion, and it also houses the Hiroshima Peace Memorial Museum. This museum tells the story of the bombing, from the start of the Manhattan Project, the bombing itself, as well as the aftermath. It also shows how nuclear energy has evolved since then, and makes a point of how many nuclear bombs there are in the world today. The museum’s message is clear: No more atomic bombs. 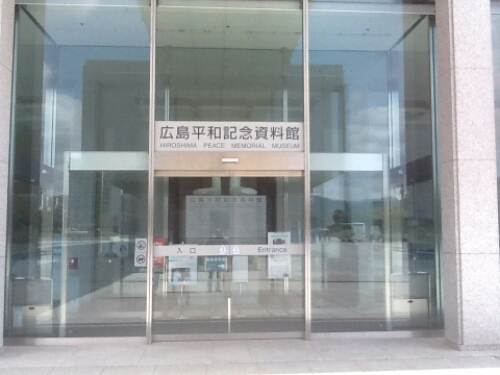 The entrance to the Hiroshima Peace Memorial Museum. 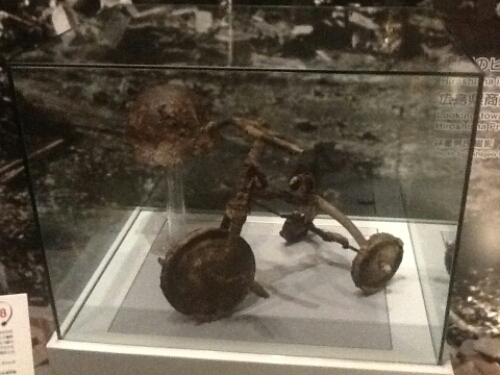 The Hiroshima Peace Memorial Museum was very emotional, it felt strange to see pictures of Hiroshima right after the bomb. The destruction, the power of the bomb. Roof tiles having melted into glass. Pictures of burned children. Watches having stopped at the moment of the explosion. Aerial photos of Hiroshima before and after the bombing, showing a city that has disappeared. 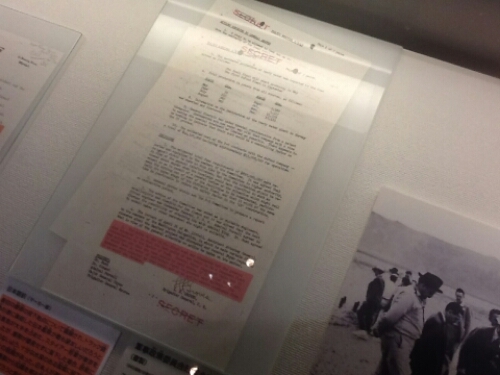 Official documents at display in the museum. There was a lot of people visiting the museum at the time, but it was still very quiet. Almost no one was talking, people only whispered to each other. Most people walked around in silence. Looking at the different displays. 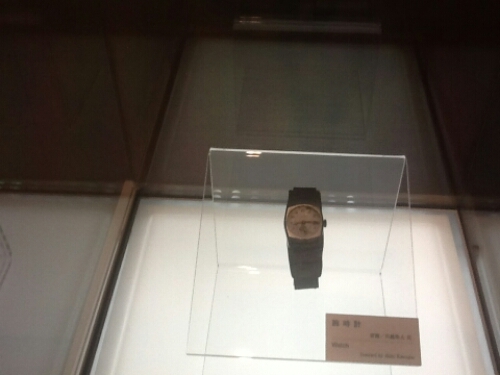 A watch having stopped at the time of the bombing. Many images from that day are stuck in my mind. Many pictures I will forever remember. I can only begin to imagine what it must have been like to live through such a cataclysmic event, and only hope I will never experience anything even remotely close to it. Read post 4: Hiroshima Castle. Read post 2: Genbaku (A-bomb) Dome.